Being in their shoes…You know, this culture values us by how productive we are. Multitasking is so desirable. Yet in that light, when someone becomes ill and “unproductive”, society marginalizes them…They fall between the cracks and are almost invisible. One is definitely “out-of-the-game.” Not only is one sick, the individual gets snubbed by society and is left battling an inner sense of worthlessness. Being supportive…Reaching out, sending support and encouragement to a friend or relative who is having a challenging health condition is so necessary and important. Love definitely aids the healing process. Sending a card, note, flowers, fruit basket, book, whatever is appropriate- conveys that you care and are thinking of the individual who is isolated by poor health. What to say?…Stay positive, do not add to their burden. Keep it brief. Do not minimize their condition. And do not diagnose the illness or give any unsolicited medical advice. Wish for a fast and full recovery, if that is possible. Gift of time…Offer help if it’s appropriate and you can really pitch in somehow. (For me, it was getting someone to feed my stray cats! I also needed rides to doctor’s appointments.) Be mindful of your friend’s requirements and need for privacy. Do sincerely offer help and don’t feel rejected if they say “no” the first time. Keep trying, the thought counts! When in doubt…Send a card with a short note inside. Choose a card that your friend can relate to, something cheerful, humorous, if possible. “Laughter is the best medicine!” Share some good news with them. Keep them in the loop. Enclose a photo, cartoon, drawing, or something cheerful and upbeat. Important note…Don’t expect them to write back. Try to contact a designated caregiver, perhaps a close relative that will keep you informed. Send your card, and call and/or visit if it’s appropriate. Cards and notes are non-threatening and they are great morale boosters! I received cards and flowers and a fruit basket when I was sick. The outpouring of love that I felt from my friends and community was like a huge hug. My heart fills with gratitude when I think about all the love that came my way during that time. From my own firsthand experience, I can tell you how very special it is to receive a get well card/letter in the mail. Please don’t hesitate, if you have a loved one who is ill.
Daniel, J. Beverly. Finding the Right Words. New York: Pocket Books, 2003. Shepherd, Margaret. 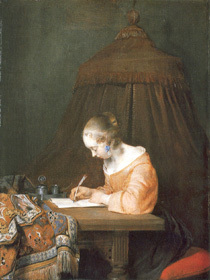 The Art of the Personal Letter. A Guide to Connecting through the Written Word.